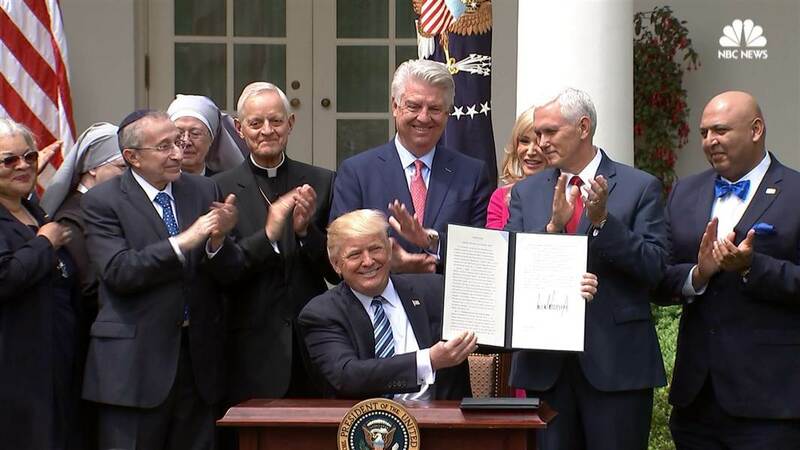 The Freedom From Religion Foundation filed suit in May, 2017, challenging President Trump's "religious liberty" executive order as it pertains to church politicking. FFRF and its co-presidents, Dan Barker and Annie Laurie Gaylor, are plaintiffs. The suit named as defendants President Trump and John Koskinen, commissioner of the Internal Revenue Service. "This executive order directs the IRS not to unfairly target churches and religious organizations for political speech. No one should be censoring sermons or targeting pastors. [Standing ovation.] . . . In America we do not fear people speaking freely from the pulpit, we embrace it." Trump also told churches that, due to his order, they would not lose their tax exemption for violating the rule against church politicking and could say whatever they wanted: "This financial threat against the faith community is over. . . . You're now in a position where you can say what you want to say." The state/church separation watchdog sued the IRS in 2014 for its failure to enforce the electioneering restrictions and settled the suit after the IRS agreed to begin enforcing existing law. FFRF had asked the federal court to declare that Trump has violated the Establishment Clause and the Due Process Clause of the U.S. Constitution, and acted in excess of presidential authority under Article II of the Constitution. Due to the admissions by the Justice Department, however, the plaintiffs voluntarily dismissed their lawsuit in December, 2017. The lawsuit, Case No. 17-CV-330, was in the courtroom of U.S. District Judge James D. Peterson, U.S. District Court, Western District of Wisconsin. FFRF is continuing to monitor legislative initiatives and other efforts meant to undermine the Johnson Amendment, the provision that ensures all nonprofits, including churches, are prohibited from electioneering. Why did FFRF sue, when others did not? 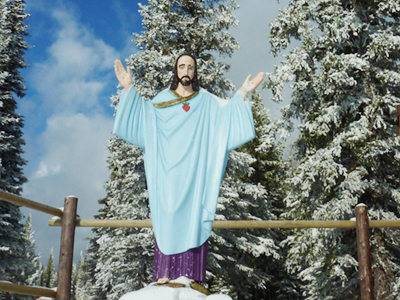 FFRF filed suit in U.S. District Court in Montana, challenging the Forest Service's decision to renew a special permit for a "shrine to our Lord Jesus Christ" on federal property in the Rockies. The Knights of Columbus, a conservative Roman Catholic men's club, has placed a devotional shrine on Big Mountain near Whitefish Mountain's Resort Chair Two in Flathead National Forest, in violation of the Establishment Clause of the First Amendment to the Constitution. On June 24, 2013, U.S. District Judge Dana Christensen issued a ruling granting summary judgment for the Defendants. FFRF news release: "FFRF challenges Catholic shrine on Big Mountain"
FFRF news release: "Judge rules FFRF's Jesus shrine suit can go forward"
FFRF filed a notice of appeal on August 22, 2013. The case was heard by the Ninth Circuit Court of Appeals. In August 2015, the Ninth Circuit, in a comparatively short 2-1 decision, ruled the Catholic shrine could stay. The blistering dissent noted, ". . . despite arguments to the contrary, a twelve-foot tall statue of Jesus situated on government-leased land cannot realistically be looked upon as 'predominantly secular in nature.'" FFRF sought an en banc review of the case on Aug. 21, 2015. FFRF news release: "FFRF seeks en banc review over Jesus shrine on Big Mountain"
That review was denied on Nov. 20, 2015. The Freedom From Religion Foundation and its North Carolina chapter, Triangle Freethought Society, are suing the Internal Revenue Service for giving religious groups preferential treatment. Under IRS regulations, all 501(c)3 non-profit organizations must file an onerous annual Form-990 — except churches. The Form 990 requires detailed reports on revenue and functional expenses, activities, governance, management, how groups fulfill their mission, and what proportion is spent on programs, management and fundraising. FFRF and Triangle Freethought spend thousands of dollars each year to complete the 990. We have to track all our money and show the IRS where it all goes. Churches and other religious organizations do not have to file this form, do not have to track their funds, do not have to publicly report their funds, and do not have to pay accountants to complete the form. The "preferential treatment of churches" directly benefits churches, while discriminating against other non-profit organizations, "solely on the basis of religious criteria." The District Court initially granted FFRF standing to sue on August 22, 2013. After the Seventh Circuit decided against FFRF on the parsonage exemption lawsuit, the District Court dismissed this lawsuit as well. The court held that FFRF and Triangle did not have "standing" to sue. The court basically said that the IRS had to first officially determine that FFRF was not eligible for the Form-990 exemption before FFRF would have standing to sue. The Foundation, with the help of Denver-area members and plaintiffs, filed suit on Nov. 12, 2008, against Colorado Gov. Bill Ritter Jr., for showing governmental preference for religion in issuing National Day of Prayer proclamations in tandem with the National Day of Prayer (NDP) Task Force. The Foundation filed the lawsuit in state court in Denver, both on behalf of four named plaintiffs and its more than 400 Colorado members. The lawsuit seeks to declare Day of Prayer proclamations and dedications by Gov. Ritter in violation of the Religious Freedom clause of the Colorado Constitution, and seeks an order enjoining him from issuing further such proclamations. The Complaint notes that not only has Ritter issued official National Day of Prayer proclamations, but he appears to have aligned himself and the State of Colorado with a national observance called Reign Down USA, an evangelical movement that promotes prayer, ostensibly for restoration of the nation. On May 20, 2013, the Colorado Supreme Court granted Gov. Hickenlooper's petition for review. The court will decide whether to uphold the appellate decision, which held that FFRF and four of its members have standing and that the state constitution disallows the governor's "Colorado Day of Prayer" exhortations. The Freedom From Religion Foundation (FFRF), along with 19 other plaintiffs is suing the U.S. Treasury for stamping "In God We Trust" on currency. Honorary FFRF board member, Mike Newdow, is acting as legal counsel in the suit, which was filed in the U.S. District Court for the Southern District of New York on February 1, 2013. IGWT was first added to coins during the Civil War and then to all currency in the 1950s. Plaintiffs allege that the religious verbiage is proselytizing, discriminatory and a per se establishment of monotheism in violation of the Establishment Clause. fulfill a flower order on the basis of religion (non-belief), in violation of Rhode Island General Laws." FFRF filed a previous complaint in January 2012 with the state Commission for Human Rights. A preliminary investigating commissioner determined in October that "probable cause" existed to believe that Plowman violated state law. The parties could have engaged in more conciliation with the commission, but the defendant chose to move the matter to Superior Court. FFRF has asked for a jury trial. The defendant told a TV reporter at the time, "It's my freedom of speech. I refuse orders when I want and I take orders when I want." FFRF filed a similar complaint with the commission about Flowers by Santilli's refusal to fulfill the order. Flowers by Santilli chose pursue mediation through the commission. Attorney Katherine Godin of Warwick is FFRF's local counsel in the lawsuit. FFRF, its Valley of the Sun Chapter and several members as well as plaintiffs who were Buddhist, Christian and Muslim, filed suit in state court, challenging the constitutionality of Arizona Gov. Janice K. Brewer's annual Arizona Day of Prayer. The lawsuit was filed in Superior court of Arizona, County of Maricopa in January of 2012. Judge Eileen Willett dismissed the case on August 13, 2012 for lack of standing and for lack of jurisdiction to issue relief to the plaintiffs. On Nov. 16, 2012, FFRF and the individual plaintiffs filed an appeal to Division One of the Arizona Court of Appeals arguing that their injuries are sufficient to challenge the Governor's proclaimed days of prayer. The Court of Appeals upheld the dismissal based on a lack of plaintiff standing on June 11, 2013. In an unpublished opinion, Judge Donn Kessler wrote that the plaintiffs would have to demonstrate the behavior of avoidance of the violative conduct or "that the alleged violation is so pervasive and continuing that it of necessity affects on a practical level how the plaintiffs interact with government." In its earlier briefing, FFRF emphasized court decisions that allowed standing where the plaintiffs had unwelcome contact with government speech promoting religion. The court did not reach the merits of the constitutional claims. On behalf of a local member, the Freedom From Religion Foundation filed a federal lawsuit on Dec. 22, 2011, in the Eastern District of Michigan, Southern Division, charging Mayor James R. Fouts, of Warren, Mich., with government censorship of its nonreligious views and unlawful endorsement of religion. FFRF sought a preliminary injunction to enjoin the mayor from continuing to establish religion “by allowing public displays of only religious symbols” and to order him to allow placement of FFRF’s Winter Solstice display. The lawsuit, FFRF v. City of Warren, was filed by the firm of Butzel Long in Bloomfield Hills, Mich., which is representing both FFRF and its member plaintiff pro bono. FFRF alleges censorship, the establishment of Christianity and denial of equal protection under the law by the city of Warren. The legal complaint summarizes the chronology of the mayor’s endorsement of religion and censorship of the views of FFRF and its member Douglas Marshall of Warren, a named plaintiff. FFRF complained about the nativity display in the city hall atrium more than a year ago, eventually receiving a response on Dec. 8, 2010, in which Fouts wrote that “all religions are welcome to celebrate their religious seasons with a display in city hall.” Marshall tried in vain repeatedly to obtain permission to place the FFRF sign in the city hall atrium. The complaint called Fouts’ denial of a permit to Marshall “an unconstitutional, content-based restriction on plaintiffs’ expression in a traditional public forum.” As the Supreme Court has held, “a principle at the heart of the Establishment Clause [is] that government should not prefer one religion to another, or religion to irreligion.” The mayor’s preference for the nativity display and discriminatory practice against the plaintiffs also denies them equal protection under the law. “As a result, Defendants send a clear message to Plaintiffs that they are outsiders and not full members of the political community, and an accompanying message that those who favor the Christian religion are insiders and favored members of the political community," charges the Complaint. FFRF asks the court to enjoin the mayor from barring the FFRF sign, to find that the city has violated the rights of FFRF and its member, and to award nominal damages and reasonable attorney’s fees. On May 31, 2012, U.S. District Judge Lawrence Zatkoff issued a ruling granting the city’s motion for summary judgment. FFRF has appealed this decision to the 6th Circuit Court of Appeals. On February 25, 2013, a 3-judge panel of the Sixth Circuit Court of Appeals affirmed the decision of the district court. In an opinion authored by Judge Sutton, the panel found Warren's display to be permissible government speech. U.S. District Judge Christopher Conner on Oct. 1, 2012, dismissed the case, ruling House officials had legislative immunity, but chastised House officials for "premeditated pandering" and expressed alarm that the resolution passed unanimously. Conner wrote: "At worst, it is premeditated pandering designed to provide a reelection sound bite for use by members of the General Assembly. But regardless of the motivation . . . its express language is proselytizing and exclusionary. . . . The court is compelled to shine a clear, bright light on this resolution because it pushes the Establishment Clause envelope behind the safety glass of legislative immunity." Ministers, who are paid in tax-free dollars, also may deduct their mortgage interest and property tax payments. Under both federal and California law, allowances paid to “ministers of the gospel” are not treated as taxable income. “Ministers of the gospel” may uniquely claim these benefits, so the statutes convey a governmental message of endorsement, unconstitutionally favoring religious employees and institutions over all others, the Foundation maintains. The lawsuit was filed Oct. 16 in California Eastern District Court, Sacramento office. Judge William Shubb will preside over the case. Attorney Richard Bolton, Madison, Wis., with local counsel Michael Newdow, Sacramento, represent the Foundation and its plaintiff members. The Foundation seeks a declaration that, on their face and as administered, provisions allowing tax benefits for “ministers of the gospel,” provided for by the IRS and Treasury Depart­ment, violate the Establishment Clause of the First Amendment to the U.S. Constitution. Defendants are Timothy Geithner, U.S. Treasury secretary; Douglas Shulman, Internal Revenue Service commissioner; and Selvi Stanislaus, executive officer of the California Franchise Tax Board, who are all providing tax benefits only to “ministers of the gospel,” rather than to a broad class of taxpayers. Certainly, in these times when we are being threatened by a godless and antireligious world movement we should correct this discrimination against certain ministers of the gospel who are carrying on such a courageous fight against this foe. Certainly this is not too much to do for these people who are caring for our spiritual welfare. Section 107(2) allows ministers to avoid paying taxes on income declared to be a “housing allowance.” The privilege also permits churches to save money on clergy salaries. Most egregiously, clergy may “double-dip,” i.e., deduct their mortgage payments and real estate taxes from income tax, even though they paid for these with tax-exempt dollars, amounting to a government subsidy solely for clergy. “All other taxpayers pay more because clergy receive this privileged benefit,” said Annie Laurie Gaylor, Foundation co-president. “The income taxation of ministers of the gospel under the general rules that apply to other individuals would not interfere with the religious mission of churches or other organizations or the ministers themselves,” the legal complaint maintains. The statutes are not an accommodation of religion, therefore, but a subsidy. The Supreme Court has previously ruled that a tax benefit given only to religion violates the Establishment Clause (Texas Monthly, Inc. v. Bullock, 1989). Withdrawn in 2011. See new Sept. 13, 2011 challenge. FFRF, with four of its Arizona members, filed a lawsuit on March 15, 2010 in U.S. District Court, District of Arizona, to enjoin Arizona Gov. Janice K. Brewer from declaring an Arizona Day of Prayer in this or future years. She has issued such proclamations in conjunction with the National Day of Prayer. The lawsuit also seeks a declaratory judgment declaring that Brewer violated the Establishment Clause of the First Amendment to the U.S. Constitution in declaring her Arizona Day of Prayer last year. On July 22, FFRF exposed the use of Gov. Perry on robocalls promoting the rally: “This is Governor Rick Perry and I'm inviting you to join your fellow Americans in a day of prayer and fasting on behalf of our nation. As an elected leader, I am all too aware of government's limitations when it comes to fixin’ things that are spiritual in nature. That's where prayer comes in, and we need it more than ever. With the economy in trouble, communities in crisis and people adrift in a sea of moral relativism, we need God's help. That's why I'm calling on Americans to pray and fast like Jesus did, and as God called the Israelite to do in the Book of Joel. I sincerely hope you will join me in Houston on August the sixth and take your place in Reliant Stadium with praying people asking God's forgiveness, his wisdom and provision for our state and nation. To learn more, visit TheResponseUSA.com, then makes plans to be part of something even bigger than Texas.” On July 25, FFRF filed a motion seeking to enjoin Perry was continuing to promote the prayer rally. FFRF asked that Perry be barred from participating “in his official capacity as governor as a speaker at the event,” and to rescind his proclamation calling Aug. 6 a “day of prayer and fasting for our nation’s responses.” U.S. District Judge Gray Miller dismissed the lawsuit on July 28, ruling that the plaintiffs lacked standing. “Nobody would have trouble seeing the injury if a governor aligned himself with a radical Muslim group and used his office to call all citizens to a daylong prayer to Allah rally," noted FFRF Co-President Annie Laurie Gaylor. FFRF held a “dinner of nonprayer and nonfasting” Aug. 5 for Houston-area members to honor the local co-plaintiffs in the case. After being denied use of any billboards near the stadium to protest the entanglement, FFRF commissioned an airplane to fly a banner: "Gov: Keep state/church separate. FFRF.ORG," over the stadium event and leased a mobile billboard with a caricature of the prayerful governor next to this message: "Beware Prayer by Pious Politicians: Get off your knees and get to work." The Freedom From Religion Foundation has joined Michael Newdow in launching a new challenge of the religious phrase "under God" in the Pledge of Allegiance. Plaintiffs include the Foundation and a Hanover couple with children in the schools who are Foundation members. The suit, filed in federal court on Oct. 31, 2007, names Congress and three local school districts. A 2002 state law requires New Hampshire schools to include recitation of the Pledge of Allegiance in every school day, but adds that student participation is voluntary. The parent plaintiffs believe that by including the phrase in the pledge, the district is "endorsing the religious notion that God exists" and thereby creates a "societal environment where prejudice against atheists . . . is perpetuated." "It should be noted that Plaintiffs are making no objection to the recitation of a patriotic Pledge of Allegiance," the Complaint notes. "The government is certainly within its right to foster patriotism, and it may certainly make the determination that recitation of the Pledge of Allegiance serves that purpose. However, the government may not employ or include sectarian religious dogma towards this end. By placing the religious words 'under God' into the pledge, Congress not only interfered with the patriotism and national unity the pledge was meant to engender, but it actually fostered divisiveness. . . in a manner expressly forbidden by the Constitution," writes Newdow in the legal complaint. On Jan. 18, 2008, 51 members of Congress won court permission to intervene in the lawsuit. The interveners, including three U.S. Senators — Sam Brownback, James M. Inhofe, and Ted Stevens — and 48 members of the House, asked the judge to dismiss the lawsuit. A number of individual religionists in the school district, as well as the Knights of Columbus, also intervened in the lawsuit. (The Catholic men's club originally spearheaded the campaign to insert "under God" into the previously secular pledge.) U.S. Dist. Judge Steven J. McAuliffe issued an order on Aug. 7, 2008, agreeing to dismiss Congress as a defendant. But the Court denied the State of New Hampshire's motion to dismiss, as well as the motion to dismiss filed by several intervening individuals and the Knights of Columbus. A 3-judge panel of the 1st U.S. Circuit Court of Appeals ruled on Nov. 12, 2010 against FFRF's challenge of the New Hampshire School Patriot Act. A request for en banc review was turned down on Dec. 28, 2010. Michael Newdow with plaintiffs asked the Supreme Court to review the decision on March 25, 2011. The Foundation and its Co-Presidents filed suit on July 14, 2009, to stop the prominent engraving of "In God We Trust" and the religious Pledge of Allegiance at the Capitol Visitor Center in Washington D.C. The lawsuit was filed by attorney Richard Bolton in U.S. District Court in the western district of Wisconsin. The House and the Senate passed resolutions in July 2009 directing the Architect of the Capitol to engrave the mottos, with an expected cost of at least $100,000. Religious members of Congress had threatened to delay the opening of the Visitors Center, through which every visitor to the Capitol must now pass, unless "God is welcomed back into the Center." The Foundation contends that the motto, "In God We Trust," is a johnny-come-lately, usurping the original, secular "E Pluribus Unum" (from many, come one), only adopted during the Red Scare in the 1950s. Similarly, the once secular pledge was tampered with by Congress in 1954, when it added "under God" wording. The Freedom From Religion Foundation, its co-presidents and several of its members are among the many co-plaintiffs in a federal lawsuit, Newdow v. Roberts, filed on Dec. 30, 2008, by attorney Michael Newdow in the U.S. District Court for the District of Columbia, seeking to enjoin the Presidential Inaugural Committee from sponsoring prayers at the official Inauguration. The 34-page Legal Complaint also punctures some myths, documenting that for most of our country's history, no clergy-led prayers at inaugurations. The original complaint has been amended to include many more freethinkers, including minor students, from around the nation, as well as a variety of groups. The case was dismissed, and lost on appeal. The national Freedom From Religion Foundation filed suit on Nov. 26, 2008, in federal court against the City of Rancho Cucamonga, Calif., for taking actions which led to the censorship of its "Imagine No Religion" billboard on Archibald and Foothill Blvd, Route 66. The Foundation had prepaid for the board and contracted for a two-month run beginning in mid-November. The Board had been up for less than a week when it was removed at the apparent instigation of a city official. "The Defendants' actions conveyed a message that religion is favored, preferred, and promoted by the City of Rancho Cucamonga and its officials, despite subsequent attempts to cover up the Defendants' involvement in sending an objectively understood message disapproving FFRF's billboard," said the Foundation. The Foundation, with three of its North Dakota members, filed a federal lawsuit in North Dakota on June 19, 2007, challenging state and county subsidy of avowedly Christian juvenile detention facilities. The ranch, run by the Lutheran Church/Missouri Synod, and the Evangelical Lutheran Church in America, "attempts to modify behavior by directing children to find faith in the Lord Jesus Christ," the Foundation legal complaint alleges. The facilities incorporate biblical teachings, subscribe to the three Ecumenical Creeds and the Lutheran Confessions, and schedule weekly Spiritual Life Groups activities, church attendance or other spiritual activities on Sundays, individual spiritual discussions, prayers at meals, baptism, confirmation studies, devotions, bible studies and related discussion groups. Post-release mentoring services also incorporate religion and are publicly funded with taxpayer appropriations. The ranches, run by two Lutheran denominations, have monopolized juvenile detention services in the state for many decades. U.S. Dist. Judge Daniel L. Hovland on July 17, 2008, granted the motion to dismiss the federal lawsuit, saying the Legislature does not explicitly mandate that state officials allocate specific funds for the ranches, so the alleged violation amounts to a discretionary action by the executive branch and may not be challenged by taxpayers. The Freedom From Religion Foundation filed a lawsuit April 19, 2006, in federal court, challenging the pervasive integration of "spirituality" into health care by the Department of Veteran Affairs. The lawsuit, filed in the U.S. District Court, Western District of Wisconsin, names VA Secretary R. James Nicholson; Undersecretary for Health Jonathan Perlin, M.D. ; Hugh Maddry, director, and A. Keith Ethridge,deputy director, of the National Chaplain Center; and Jeni Cook, program manager of the Spiritual Health Initiative. The lawsuit alleges that the Veterans Health Administration, the nation's largest integrated health system, "has deeply committed to integrate faith, spirituality and religion into the substantive protocol of its medical treatments," in a manner which unconstitutionally promotes, advances and endorses religion. The complaint observes that the VA now "provides pastoral services not as an accommodation to veteran's free exercise rights" but because it "deems pastoral services for all patients, including veterans receiving outpatient medical services, to be a necessary part of medical treatment." The VA encourages all patients "to tap into their alleged spiritual resources of faith," with VA chaplains involved as "part of the treatment team for all patients." The VA now plugs in chaplains to outpatients (making up 80% of patients) whose religious needs do not require special accommodation. In September 2006, Judge Shabaz ruled against a VA motion to dismiss the lawsuit, which contended FFRF had no legitimate Establishment Clause claim. Shabaz ruled that if the facts are as alleged, there is merit in the lawsuit and it may proceed. Read the news release, which contains a link to the judge's Memorandum. Judge John Shabaz ruled on Jan. 8, 2007, that the integration of religion and "spirituality" into all aspects of medical care is permissible because it is ostensibly "voluntary." The Foundation, which contends coercion is not necessary to show an Establishment Clause violation, appealed the decision to the 7th U.S. Circuit Court of Appeals. The government asked to stay the case pending the decision of the U.S. Supreme Court in FFRF v. Hein, deciding whether citizens have standing to sue over so-called discretionary spending that violates the Establishment Clause by the Executive Branch. This stay was granted, despite the fact that standing was never raised as an issue at the district court level and had not been contested. The government's motion to stay the appeal, pending the U.S. Supreme Court decision in Hein v. FFRF, was granted by the 7th U.S. Circuit Court of Appeals. Oral arguments were heard in January 2008. A state-funded fundamentalist Christian prison ministry program ("God pod") in a women's prison in Grants, N.M., was challenged in federal court by the Freedom From Religion Foundation on Nov. 7, 2005. New Mexico contracts with Corrections Corporation of America, also named as a defendant, which is the nation's largest private provider of prison services. CCA partners with the Chicago-based Institute in Basic Life Principles, a fundamentalist Christian ministry run by Christian reconstructionist Bill Gothard "for the purpose of introducing people to the Lord Jesus Christ." Women prisoners are given proselytizing workbooks training them to "submit" to male authority. CCA plans to "franchise" the Christian program in prisons. Read press release. One of the first casualties of Hein v. FFRF was FFRF's strong lawsuit against the State of New Mexico for establishing an outrageous Christian dominionist "God pod" in a women's prison in Grants, N.M. FFRF withdrew the lawsuit in July 2007, after the judge said he would rule against the right of FFRF's state taxpayers to sue. FFRF hopes to challenge religion programs funded by tax dollars in prisons with prisoner plaintiffs in the future. Details on Unconstitutional "Faith Pod"
Hein v. FFRF. In June 2004, the Freedom From Religion Foundation filed the first lawsuit to challenge the creation of the White House Office of Faith-based and Community Initiatives, as well as eight Cabinet-level "offices of faith-based initiatives." The Foundation alleged that conferences arranged by the White House office resemble revival meetings, and demonstrate government preference for funding religious social service agencies. The lawsuit alleged that the Departments of Education, Labor, Justice, and Health and Human Services have shown preference in funding religious organizations, and that many intermediary groups receiving federal funding do likewise. The case is the Freedom From Religion Foundation v. Jim Towney, et al., 04 C 03981, U.S. District Court, Western District of Wisconsin, Judge John Shabaz. On March 9, 2005, the Foundation asked the U.S. Court of Appeals for the 7th Circuit to reinstate its legal challenge of the creation of the White House and other federal "faith-based" offices. On Jan. 13, 2006, a 7th Circuit panel, in a 2-1 decision, reinstated the Foundation's challenge, finding that taxpayers have a right under Art. III of the Constitution to sue over a violation of the First Amendment Establishment Clause, even if Congress did not specifically earmark money for the challenged program or activity. "Taxpayers have standing to challenge an executive-branch program, alleged to promote religion, that is financed by a Congressional appropriation, even if the program was created entirely within the executive branch, as by presidential executive order," wrote Judge Richard A. Posner, joined by Judge Diane P. Wood. The 11-member panel of the U.S. Court of Appeals for the 7th Circuit in Chicago voted 7-4 not to rehear the question of standing in the Freedom From Religion Foundation's federal lawsuit challenging creation of federal faith-based offices. This technical victory for the Foundation allowed the lawsuit to continue. The Administration appealed the Foundation's right to sue to the highest court. The U.S. Supreme Court, on Dec. 1, 2006, agreed to hear the Bush Administration's appeal of the reinstatement of taxpayer standing for the Foundation plaintiffs. Oral arguments were held on Feb. 28, 2007. At issue was whether the Foundation's taxpayer plaintiffs--co-presidents Dan Barker and Annie Laurie Gaylor, along with FFRF president emerita Anne Nicol Gaylor--have standing to sue over the creation of the faith-based offices. The Foundation notes that two of the three Supreme Court cases on the question of taxpayer standing to sue the executive branch over actions which violate the Establishment clause are in its favor. The case is now titled Hein v. Freedom From Religion Foundation. Read the news release and pdf files of the Foundation's briefs before both the U.S. 7th Circuit and the U.S. Supreme Court. The Supreme Court decision came down on June 25, 2007. Although FFRF lost its right to sue the executive branch over the creation of faith-based offices at the White House and Cabinets in Hein v. FFRF, FFRF did win the plurality opinion, as The Los Angeles Times pointed out. FFRF had 4 justices solidly in our camp, whereas the bloc of 5 Roman Catholic judges against us-Roberts, Alito, Scalia, Thomas and Kennedy-was divided. Although Kennedy, the swing vote, defected to the majority on FFRF's right to sue, he refused to vote to outright overturn the precedent of Flast v. Cohen, which permits taxpayers to sue over Congressional actions which violate the separation of church and state. The Hein decision says federal taxpayers do not have the right to challenge executive branch violations not explicitly authorized by the legislative branch. The unjust decision means our country has a constitutional separation between church and state, but no way to enforce it in this and many other instances. The punchy dissent, written by Justice Souter and signed by Justices Ginsburg, Breyer, and Stevens, noted: "If the Executive could accomplish through the exercise of discretion exactly what Congress cannot do through legislation, Establishment Clause protection would melt away." The Establishment Clause is in for a rough ride in the Roberts Court. Emory University received a $1.5 million federal grant from Health and Human Service, announced in October 2002, to support faith-based community health programs across the country. Emory's Interfaith Health Program (IHP) disbursed $900,000 of its public grant to nine "religious health conversion" foundations, who in turn were charged with awarding subgrants. The grant application stated that "sub-awards will be granted to 49 faith-based organizations." At the point of the legal challenge, at least 80% of subgrants had gone to religious agencies. The Emory grant application identified religious goals such as the improvement of "government/FBO collaborations." Emory admitted in correspondence with HHS that "some of the Foundations exercise a preference in their private grant making for competent applications which reflect their own religious heritage." On January 11, 2005 (as the Foundation's attorney was at Emory taking depositions), Shabaz ruled the Foundation had not proved the funding was unconstitutionally favoring religion. In the same decision, Shabaz ruled in favor of the Foundation's challenge of federal funding of MentorKids USA. The Freedom From Religion Foundation went to federal court in Missouri to sue over the phrase "So help me, God" on tax forms, on behalf of a plaintiff in Christian County in 1998. The case was dismissed from federal court since it concerned taxes. The Foundation refiled in state court in 1999. In April 2001, the judge ruled against the Foundation, but ordered that the plaintiff or other citizens be allowed to cross out "So help me God." After numerous requests by its membership, the Freedom From Religion Foundation, with its attorney Robert R. Tiernan, went to federal court in Denver challenging "In God We Trust." The Freedom From Religion sued the federal government in 1994 to have "In God We Trust" removed from currency and as our national motto. The motto was put on all paper currency by an Act of Congress in 1955. The phrase was chosen as our national motto by an Act of Congress in 1956. It first appeared on paper currency in 1957. The Foundation lawsuit was dismissed by a 10th Circuit federal judge on the grounds that "In God We Trust" is not a religious phrase (1994). The Foundation appealed the dismissal to the U.S. Supreme Court, which did not take the case in 1996. In January 1996, the Freedom From Religion Foundation sued over the removal of its properly-placed banner, "State/Church: Keep Them Separate," from the rotunda of the Wisconsin State Capitol, at the orders of Gov. Tommy Thompson. The Foundation had obtained a lawful permit to place the sign to counter various seasonal promotions of religion at the State Capitol. The Foundation lost at the federal court level in 1996. However, the State regulations now permit moderate-sized signs. The Foundation has erected a Winter Solstice sign every year since, which has been called a "tourist attraction." The Freedom From Religion Foundation went to Colorado state court to remove a Ten Commandments monument on Capitol grounds in Denver in 1989. The trial judge ruled that the Ten Commandments were the basis of constitutional law in 1992. In June 1993, the Foundation won the case before the Colorado Court of Appeals. The State Supreme Court in November 1994 reversed the appeals court ruling, and the U.S. Supreme Court, in 1995, refused to take the case. In early 1991, the Freedom From Religion Foundation, with two local plaintiffs, challenged a lighted nativity scene in a public park in Waunakee, Wisconsin, which was stored, lighted and maintained by the town. The Foundation appealed a decision calling the creche a "secular" symbol in 1992. In 1994, the Wisconsin Supreme Court, unbelievably, upheld the creche, saying the constitution required it to "protect the rights of the majority." The Freedom From Religion Foundation no longer takes lawsuits in state court in Wisconsin! The Freedom From Religion Foundation won the first round of its lawsuit to block the state of Wisconsin from granting $100,000 to assist building a center, with no strings attached, at St. Norbert Catholic College, DePere, Wisconsin, in a lawsuit filed in 1989. The funding was part of a budgetary maneuver and no public hearing was ever held. In 1990, the Foundation won at the Dane County circuit court level. Judge Robert Pekowsky ruled that the legislation did not contain necessary safeguards to assure that the taxpayers' compulsory donation would be used only for nonreligious purposes. The articles and bylaws of incorporation for the "Norbertines" provide that it is "to be operated within the context of the teachings and doctrines of the Roman Catholic Church." In September 1991, a state appeals court overturned the St. Norbert's Victory, and in 1992, the (Catholic-dominated) Wisconsin Supreme Court refused to hear the appeal. In 1985 the Freedom From Religion Foundation filed a lawsuit challenging a Ten Commandments monument in a public park in La Crosse, Wisconsin, donated by the Fraternal Order of Eagles. Preparing for the trial in 1987, the attorney in the case deposed the Eagles official who came up with the idea, who explained how he and director Cecil B. DeMille got together to promote the Ten Commandments, Minnesota granite and DeMille's new epic movie. The federal judge found that, based on a technicality, the La Crosse plaintiff, a lifelong resident, schoolteacher and daughter of the former local Congressman, did not have standing to sue (1987). This case has been revisited by the Foundation with 22 local plaintiffs, and to date, the Foundation has prevailed in court. In 1986, the Freedom From Religion Foundation, with Illinois member Steve Van Zandt, filed a federal lawsuit to stop the building of a chapel at the Illinois statehouse. The chapel had been suggested during a visit by TV evangelist Pat Robertson. In December 1986, the Foundation won its lawsuit at the trial level, with a strong, eloquent decision. In January 1988, the appeals court inexplicably ruled that the prayer room had a "secular purpose." The silver lining: the chapel was never used. In 1978, the Foundation filed a federal lawsuit challenging public payment of prayers by preachers to open the Wisconsin Legislature. The case languished in federal court for five years without being heard, then was dismissed when the U.S. Supreme Court acted on a similar Nebraska case, Marsh v. Chambers (1983), finding that the prayers were "traditional." The Foundation later prevailed on the Wisconsin Senate to drop paid prayers for at least one session (1985). The Freedom From Religion Foundation was the first to challenge a Congressional proclamation calling 1983 "The Year of the Bible." Gaylor v. Reagan was eventually dismissed as moot by U.S. District Judge James Doyle when Reagan signed the Congressional resolution. But the lawsuit commanded major headlines, TV talkshows and interviews for the Foundation. The proclamation was delayed following the filing of the lawsuit, and the version that was belatedly signed was also weaker than the original wording proposed.